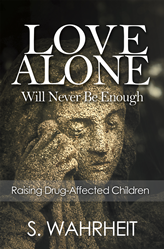 “Love Alone Will Never Be Enough: Raising Drug Affected Children” by S. Wahrheit is a gripping memoir following the author and her husband as they adopt and raise three drug-affected children. Research and information on drug-affected children, defined as children whose parents used drugs either in utero or in infancy, is scarce. Wahrheit shares research she conducted on the topic for her master’s thesis and draws upon her personal experiences adopting and raising her three drug-affected children. Mary Joan Vera (pen name S. Wahrheit) has a bachelor’s degree in Art and minor’s degrees in Psychology and Home Economics from the College of the Holy Names and a master’s degree in Psychology from California Coast University. She also completed the Play Therapy from Portland State University She is a retired Counselor and retired member of the National Education Association and the Oregon Education Association. She resides near Portland, Oregon in Oregon City.